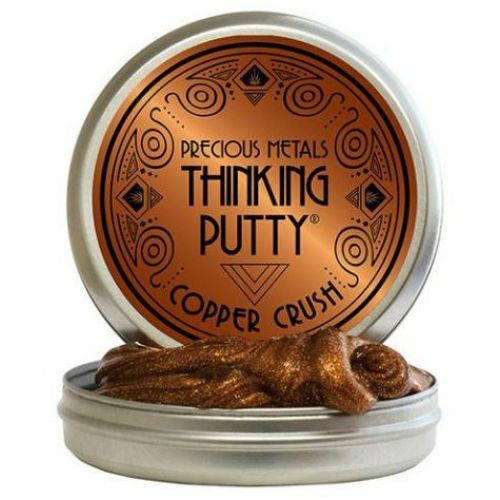 Crazy Aaron's Copper Crush 4" Thinking Putty. Copper is thought to be the very first metal mined and used by humankind some 10,000 years ago. Soft, malleable, and undeniably beautiful, it was used for tools, weapons, and most notably sculptures. The Sultanganj Buddha is an impressive example. Weighing over 1,100 pounds, it's crafted from pure, unrefined native copper. Aglow with exquisite sienna brown sparkle, Copper Crush Thinking Putty is the perfect way to create something equally extraordinary.